“All my life I have loved colour and fabric. 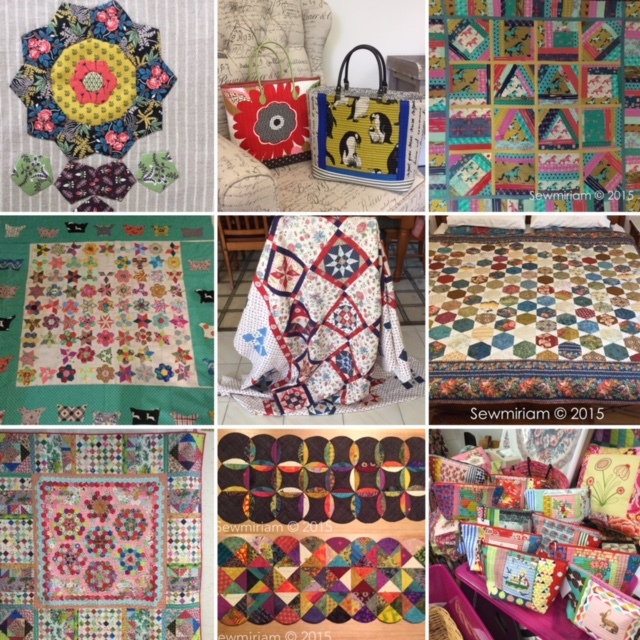 For 25 years I have been quilting. I started off teaching myself with a book about how to make a sampler quilt with really no idea what I was doing! From there I have slowly built up my skills and now I am making my own patterns, teaching others and writing my blog sewmiriam.blogspot.com.au It is the joy of sharing with others and making friendships that has really inspired me to do this. I make all kinds of projects, both big and small, and love the way there is always more to learn and try. Alas, only one lifetime to do them all! I wear many hats. I am a Speech Pathologist and a Primary School Teacher too, I love books and have studied literature. I have lived in Japan for 7 years and England for 4 years. All of these experiences have influenced and enhanced my love and appreciation of fabric, colour and design. I am proud to be a member of Fairholme Quilters. Their generosity, encouragement and amazing charity work motivates me daily. Hope you can join us for the May Meeting …..